The Halo 3 Beta was a phase in the development of Halo 3, produced by Bungie Studios and organized by Microsoft. It was the open beta of the video game Halo 3, which was later released by Bungie on September 25, 2007. The Halo 3 Beta was an intermediate build of the multiplayer functionality of Halo 3. It was first released to selected members of the public on May 11, 2007, and its purpose was to collect information and feedback from the millions of playtest games played through the multiplayer beta to refine Bungie Studio's final multiplayer product and to advertise Halo 3. Over the four weeks of the Beta, 820,000 unique users clocked up over 12 million hours of play - the equivalent of a single person playing Halo 3 for 1,400 years. 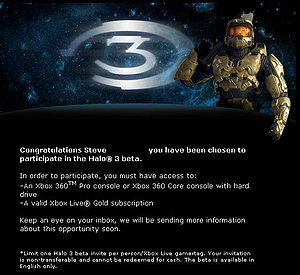 Halo 3 Beta Special Invitation. Because it was highly popular, there were only three phases for the general public to enter into to have access to the multiplayer beta. Phase One consisted of getting onto www.halo3.com after the Halo 3 Starry Night CGI Trailer that aired on December 14, 2006. 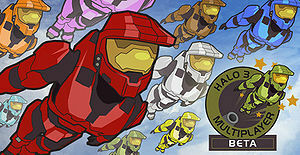 Players that entered into www.halo3.com quickly enough were selected to participate in Phase One, and received an email notification on the week of January 22–26, 2007. Players interested in entering via Phase Two were to play at least three hours of Halo 2 multiplayer sessions on an Xbox 360 on Xbox LIVE during the three day period beginning February 1 at 12:01 am EST and ending February 3 at 11:59 pm EST and had to be of 17 years of age or older. Afterward, players signed up on www.halo3.com on February 5 at 1:00PM EST for their chance to participate in the Halo 3 multiplayer beta. If the player was one of the first 13,333 to do this and meet the requirements, they would receive an invite notification on February 11 or February 12 to participate in the multiplayer beta. If not selected to participate in the multiplayer beta through Phases One or Two, interested players had a third chance to enter. Crackdown, a video game unrelated to the Halo series, was released on February 20, 2007 (Feb 22 - Asian territories, Feb 24 - European markets). Players could get into the Halo 3 beta by purchasing specially marked boxes of Crackdown. These boxes of Crackdown included an invite to participate in the Halo 3 Multiplayer beta when it became available. Owners of Crackdown that had access to an Xbox 360 console with a hard drive and a valid Xbox LIVE Gold subscription could simply download the Halo 3 Beta by selecting "Downloads" on the Crackdown main menu, then select "Download Halo 3 Beta". After the Halo 3 Beta finished downloading, players would then select "Downloads" on the Crackdown main menu, then select "Play Halo 3 Beta". 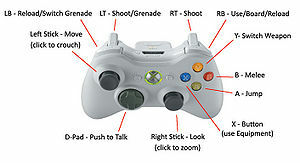 Also note that to play the Halo 3 Beta, players must have had the Crackdown disc in their Xbox 360 console. Players could not rent the game to just play the beta, nor could they buy the game, download the Beta, and sell the game. Numerous problems had been encountered with the Halo 3 Beta, one such problem being a 14-hour setback in its release for many Crackdown users, downloading errors, and matchmaking errors. To compensate the gamers, Bungie had extended the period of play until June 10, 2007 at 11:59 PM PDT (from June 6, 2007, which was the originally intended end date). “ Do not show this to anyone. Do not show screenshots to anyone. Do not talk about this, post about this, blog about this, complain about this, brag about this, or write about this (outside the sanctity of our beloved BetaPlace, of course). Otherwise, ninjas will be sent to bring ruin on your house and your house's houses. And I don't mean those punkass run of the mill MSNinjas. I mean the other ninjas. The cool ones. The ones on fire. Yeah. That's right. This was placed in the coding of the closed Beta, and was meant to prevent staff from leaking footage or information about it. The open Beta, that was available to various players outside of Bungie and Microsoft, still contained the code, although it was not meant for the open Beta. When some people first started playing the Halo 3 Beta, the loading screen said "Love, Bungie", after the usual and typical "Loading..." and "Halo 3 Beta". During the Beta, several players posted videos of a possible version of the Master Chief's face. This face was an Easter egg left by Bungie, and is, in truth, a photoshopped image of Marcus Lehto. In the Halo 3 Beta, the MA5C Assault Rifle had an animation where the charging handle would move back and forth when firing. In the final version, this was changed for reasons Bungie has never revealed. The Trip Mine in the Beta was far more deadly than its final version, as the Beta Trip Mine could stick to the underside of an unmanned vehicle. As soon as this rigged vehicle was touched, the mine would trigger. The reticule for the Spartan Laser was different in the Beta Version. The Beta reticule no longer featured a dot in the center, and the cross-hair's four corners weren't connected to one another. They instead formed a diamond in the center, resulting in a vague outline of where you were aiming. The Spartan models in the beta were far more detailed than the final version, including paint chips and dents in the armor. They also had a bit more contrast in the visor of their armor. In addition, by what can be observed from the paint chips and dents, it can be noted that the Spartan model used in Halo 3 Beta is actually the same model they used for John-117 in the actual Campaign. The change in the final version was can artistic choice and not technical. On May 11, both members of the press and people part of the "Friends and Family" program got the Beta 5 days before everyone else.